The cycle is complete - #QE4EVER pushes stocks to record highs. This is really pretty self explanatory but remember that in the last 2 weeks as stocks have surged 10-12% - IBM and Walmart missed, Retail Sales missed, Durable Goods missed, and QE3 ended. However, the promise of more QE is always just around the corner and thus, stocks continue to surge. This was put together by someone else but note that when the Fed said it was time to remove accommodation stocks crashed. When the Fed hinted at QE4 stocks started bouncing and with today's further Japanese easing the risk on rally remains intact. I suspect this hold through the election but after that your guess is as good as mine. A couple of thoughts on "plunging" gas prices and what it really means to consumers and the US economy. 1) So we have to use some generalizations when talking about the issues like national averages, but it is widely reported that the "average 35-54 American" drives about 14,000 miles per year which works out to about 270 miles/week. The average miles per gallons achieved by new cars in the US is around 25 mpg, but we know there are many older cars out there as well so let's assume 22 mpg is a national average. Thus, the average American would use about 12 gallons of gas/week. Now if we look at the change in the retail cost of gasoline over the past six months we see that it has fallen sharply - almost $0.70/gallon. Take $0.70/gallon x 12 gallons per week and you are saving almost $8.40 per week! Over the course of a month you could save enough to take your family to the fast food restaurant of your choice! 2) Then we have to look at the recent decline as it compares to the longer trend. Here is the 11 yr price chart (with Syracuse prices in Red). On this chart the recent "plunge" in gas prices doesn't really show up does it? You can also see that since 2005 and hurricane Katrina caused a spike in prices to $3.00/gallon, gas has pretty much been in the $2.50-$3.50 range for most of the country. 3) Finally, here's the thing that is catching some people off guard - yes, lower gas prices puts a few more dollar bills in your pocket but remember all of the joyful proclamations about all of that oil the US produces? 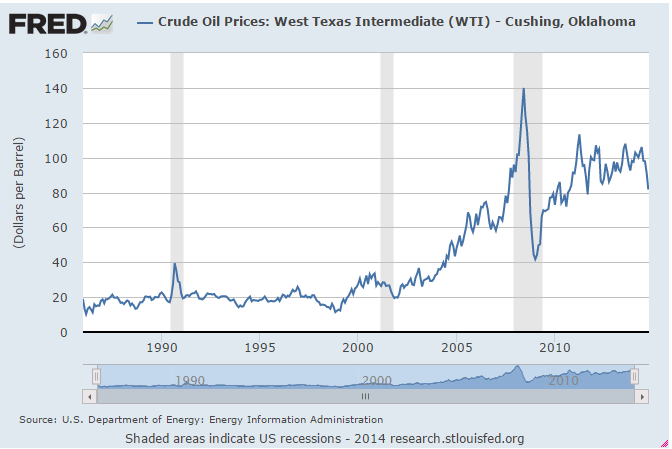 Well, lower crude prices means weaker corporate results for many large oil and gas companies. Also, a prolonged period of weakness could really impact some regions that have been booming (like Houston) and just today we saw Goldman start to pull back growth expectations for the US because of lower oil prices. The drag on major oil and gas companies is now so substantial and they've become such an enormous part of the US economy that it now outweighs the possible benefits that consumers may see from lower prices. Hey, buddy do you want to take this house off my hands? If you live in NYS you can't escape a certain car dealership and their relentless ads. Even if I'm just turning on my TV to get to Netflix or Amazon there is a 82.4% chance I'll see one of his ads. We discussed previously this dealer's penchant for hype with his "buy a car, get a cruise" promotion, but the latest promo - Come into our dealership and get a chance to win a HOUSE - will thankfully come to a conclusion later this week. 1) a vacation house in Cape Coral, Florida - a lovely town apparently but one that seems to have a bit of a foreclosure issue. 4) a trip on the $300 cruise that was earlier advertised. The total value of the package is $164,885. Ok, I can hear you now - who wouldn't take that? Stop being such a grumpy old man shouting "get off my lawn" Mr. Grindstone Financial. Well, further down in the mouse type is something that should tip you off to what is most likely going to happen. "The Grand Prize Winner shall be responsible for the payment of any and all federal, state and local taxes." Ding, ding, ding! We have a winner. You see, this "prize" is actually INCOME. So, if you make $50,000 and you win this prize you're income in 2014 will jump to $215,000 and you'll be asked to write a check in the neighborhood of probably $50-$60,000 to the IRS and NYS. While, it's impossible to know exactly how much the tax burden for each individual would be, it is unlikely that the sort of person that goes to a car dealership to enter a contest to win a house has $50,000 in cash sitting in the bank to cover a sudden tax burden. Ah, but never fear, the dealership has thought of a way to fix all of your problems! "In the event that the Grand Prize Winner is unwilling to accept the Grand Prize, they may elect to take $50,000 in cash as an alternative prize". Now, you still have to pay tax on that cash, so you'll probably clear $30,000 or so, but at least you would have cash to pay the taxes. Still, $30,000 is a nice prize but not exactly enough to buy your dream vacation home. Anyway, if anyone that reads the blog does win here is my advice and since this is free understand that you get what you pay for - take the house/car/cash package. Then immediately upon closing, put the house/car package up for sale for $120,000 cash. You'll probably get a bunch of bidders on a new car and house for $120,000 (heck, shoot me an email and we'll settle up quickly). Sell the house/car ASAP and now you'd have $130,000 in the bank (adding in the $10,000 cash piece of the prize). Take $50,000 (or whatever your tax attorney says you owe) and on April 15, 2015 write a big painful check to Uncle Sam and NYS. Again, I'm not even allowed to do the taxes in my own home so understand that my tax knowledge is only slightly better than that of the average Congressman. I sort of half joked last week that if we had a few more false Fed rumors stocks could get back to all-time highs. Little did I know at the time that things would play out that way. In a Fed news vacuum stocks have continued to levitate like it's 2000 all over again. For a little perspective, in late Sept-October stocks dipped 8-9% in a matter of days on concerns over the global economy. Those concerns turned out to be valid when companies started reporting earnings and (with a few exceptions mostly caused by fancy footwork) the results indicated a slowing global economy. However, a hint of a rumor of someone hearing something somewhere about the Fed sent the computers into overdrive and stocks have now jumped between 6-10% in 2 WEEKS! As I've tried to explain before the stock market of today bears little resemblance to the stock market of ten years ago. Prices are just something on a screen to be moved about and they bear little resemblance to what is actually going on at the companies they represent. I'm currently of the opinion that we are in the midst of a modified version of June 2000. If you remember back then stocks had taken a beating in March/April only to soar 25% in 5 weeks on little news. Then, reality set in. Today things are waffling a bit sort waiting on every word from the Fed. I'll follow-up later if anything meaningful is said. The 2014 congressional contests are on track to be the most expensive midterm elections in history, according to a new report from the Center for Responsive Politics, which projects that nearly $4 billion will be spent by candidates, parties and outside groups by Election Day. Candidates and parties are projected to spend about $2.7 billion, while outside spenders — chiefly “super PACs” and political nonprofit organizations — will spend about $900 million. In 2012, in the midst of President Obama’s re-election campaign, total outside spending reached $1.3 billion. The total does not include additional money spent on so-called issue ads and get-out-the vote activities, which outside groups and labor unions are not required to report to the Federal Election Commission. All told, 2014 spending is projected to exceed by $333 million the amount spent in 2010, but will be roughly on par with the $3.6 billion spent on congressional races during the presidential election cycle in 2012. Conservative and pro-Republican forces are on track to spend at least $1.92 billion, while liberal and pro-Democratic groups will spend somewhat less, about $1.76 billion. Those totals may significantly underestimate the gap, however: About three-quarters of all political advertising in this cycle benefiting Republicans has flowed through groups that are not required to disclose their finances, compared with about a quarter of all advertising benefiting Democrats. When a new idea or concept enters a static industry or profession, it is said to be "disruptive". This is typically viewed as a positive because, while there will be some hiccups along the road, in the end we'll all be better off for it. We had the dotcom bubble 1.0 which despite all of it's problems left us with a new way to buy everything via Amazon. We're in the middle of dotcom bubble 2.0 and while I think most of these companies will fade into the background over time, the emergence of social media is not going away. I'd like to take a moment to discuss an industry which is absolutely ripe for disruption - the US political system. I will use the current Congressional race in NY-21 as the template but this is an issue across the nation. Background: Our current Congressman - Rep. Bill Owens (D) - announced that he was not running for re-election earlier this year. This caused quite a stir as both parties scrambled to find candidates to place on the ballot. Both parties are running candidates from outside of our district. Okay, okay, I know you can argue they both "live" here but come on, we know they live in the North Country like I eat "healthy" :). However, the national and state parties believe that they are candidates who can raise lots of money and will vote the party line. This is why the election process is ripe for disruption: your congressional representative is no longer seen by the national parties as representing you, but rather a permanent vote in their column on national issues. There are enormous sums of money being spent to discourage you from voting one way or the other (very little of the advertising has focused on ideas). But here's the secret that no one at the DNC or RNC wants you to know: They can spend millions and millions of dollars on ads to try and buy your vote, but if you won't sell ...it doesn't matter! Every election in America has become a battle of who can raise the most and spend the most in an effort to buy your vote. A critical piece of this equation though is you and your vote - you have to be an willing participant in this process for that model to work. If you walk into your voting cube and check (R) or (D) just because they told you to, then they win and the "spend, spend, spend" model remains legitimate. However,if we can get enough Americans to say "my vote is not for sale" they can spend every dime in their pocket and it won't matter because you won't sell to the highest bidder. Okay, I can see you nodding along - Great you say, let's be the change!! What are the alternatives? Well, there are the third parties, but as my Mom said, if you don't have anything nice to say, it is better not to say anything at all. Here's where it gets really radical: write-in. I know, I know the concept of a write-in feels like throwing away your vote, but hear me out. You aren't going to get the 50,000 - 75,000 people to back one write-in candidate at this point that would be necessary to win an election. Since this is an off year, turnout could be low so I expect the winner of NY-21 will get somewhere around 80,000 votes. Who knows, maybe in today's Facebook era you could pull this off, but it's unlikely. However, the margin of victory in NY-21 district is likely to be far less than 10,000 votes (more likely +/- 5,000). If we can start a #myvoteisnotforsale movement online, I think it is possible to get 1,000 people to write-in a candidate other than the two chosen by the state and national parties. A thousand votes in a tight congressional race would be a catalyst for a conversation about the future of politics and the influence of money in our political system. So every time you post a comment on facebook or mention tweet out your dinner plans use the hashtag #myvoteisnotforsale #NY21 and let's stake our claim to the seat in Congress which claims to represent us, okay? * Go to www.grindstonefinancial.com (many of you only get my emails and never visit the site) - click the "share this on Facebook" button up on the right hand side. * Post something on your Facebook wall, twitter feed about this post and link to it (go to your browser bar, click copy, then paste it in your Facebook wall). * I joined the borg so I could create a new FB page: My Vote is Not For Sale. Like the page. Coming soon - Part 2 - Okay, you talked me into it now how do I write-in someone?? Futures and overseas markets are looking up again as the deep abyss of the crisis from way, way, way back on Wednesday continues to dissipate. I guess the fact that only one school was shelled over the weekend in Ukraine, one nuclear sub did or did not go missing, ISIS is only "training" pilots with the help of the Iraqis, Hong Kong chaos has stabilized and no new cases of Ebola popped up in the US, so that has given everyone the green light to buy every stock that isn't nailed down. However, insiders are still having hushed conversations about last Wednesday's market freak out. This is pretty wonky stuff so I'll boil it down to the basics - someone was sufficiently scared to buy every US treasury future they could get their hands on. This panicked buying pushed yields in the 10 year treasury below 2% and the volume of contracts was the stuff of legend. As one Wall Street quote machine said last week "this is the stuff you'll be telling your grand kids about". For a little perspective the volume of contracts traded was roughly 5 times (!) the number of contracts traded during the previous peak of panic - when Lehman Brothers collapsed. So, here's what we know - either someone is really, really in the know about something or some computer program ran wild and moved the biggest market in the world like it was the market for beanie babies. I'm leaning toward this was a computer model run amok but hey, what do I know. * A Maine elementary school teacher has been barred from school after visiting Dallas, Texas, where Ebola patients have been treated - despite having no contact with any suspected sufferers. * It comes after hundreds of parents removed their children from a middle school in Mississippi because the principal visited Zambia - 3,000 miles from any countries struck by the deadly disease. The market has exploded higher today on hints, rumors and innuendo that the world's central banks were just kidding about that whole "ending QE" thing. This is the quandary that the central banks have created. Every time there is a hint of ending their low cost borrowing programs (QE) the markets throw a mini-temper tantrum until the Fed relents. 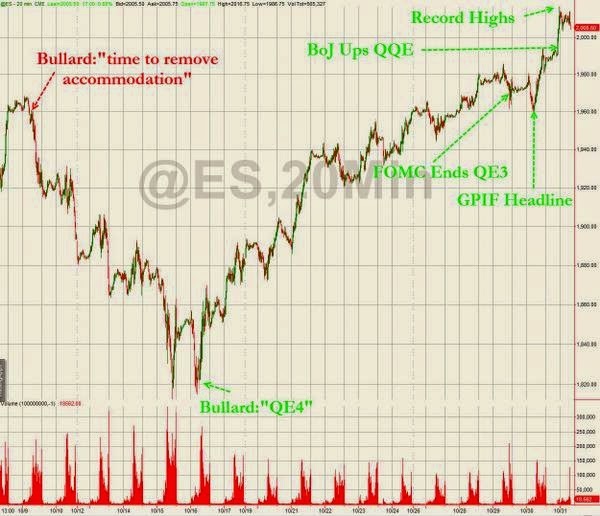 This time all it took was 2 weeks to get the Fed to calm everyone with rumors of QE4. As a point of reference consider this chart from Goldman & The Federal Reserve. The stock market has gone so long in this artificially supported mode that all of the "corrections" of the past 5 years barely even register. However, look at these 2 charts - see that little dip in stocks (the blue line) in mid-2010? That is when QE was supposed to end. However, stocks dipped 10% and the Fed came to the rescue with QE2 at the end of 2011 (note stocks not only recovered from the dip but added another 15%). Then in the end of 2011 stocks started to dive again - so Operation Twist was launched and stocks recovered in early 2012. In late 2012, stocks just flat-lined and that was enough to garner QE3 which led to the 30% explosion in stocks over the past 18 months. This brings us to the present day - the blue line shows the 5-8% decline we've seen in stocks this month. 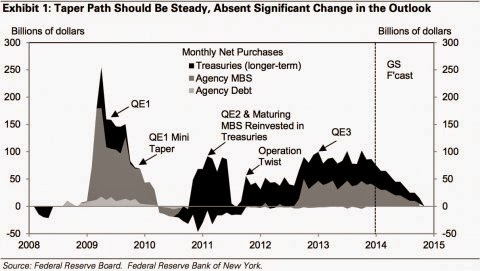 The top chart shows what the Fed is supposed to do with QE. However, now that is clear that the Fed really intends to take away the markets meth this month, the stock market freaked out again and that has caused many to say that QE4 is on the table. We all joked about QE2, 3, 4.... when the original QE program was launched, but here we are. Stocks have become fully dependent on central bank support. Without this support I suspect stocks would be 30% lower than they are today however, there is no one willing to force them to pull the plug and thus it's rally on for today. Making a living by 11am, Oils big reversal and EBOLA - EVERYBODY FREAK OUT! For the second straight day stocks took a dive on the open only to sharply recover most of those gains by the end of the day. I've been telling people that I talk to that October has felt like someone is desperately trying to make their entire bonus for the year in 2 weeks. By moving the markets violently in one direction and then whipping them back in the course of an hour, active traders in options are making small (and not so small fortunes) as long as you are on the right side of the trade. Today's recovery seemed to be driven by the sudden, and as of right now, unexplained spike in oil prices this afternoon. As I mentioned earlier this week, oil prices have been tumbling on rumors that Saudi Arabia was going to sell oil below the market price to hurt the economies of two major producers (namely, Russia and Iran). However, what the parties involved forgot was that the US Shale boom is premised on oil being at or above $100 (exploration and extraction of shale oil puts the cost per barrel at $65-$90/barrel for most locations). With oil trading at $80 this morning, many of the US shale companies were starting to get crushed in the stock and bond market. This is the funny thing that all of the "frack, baby, frack" people tend to forget. We've known that this oil was in the ground for decades but it's only economically feasible to get it out at a certain price. When oil is $100 and you're paying $3.85/gallon, they will keep fracking. If oil fell to $50 per barrel (I know that seems crazy but oil spent most of the 90's and early 2000's between $18-$38/barrel), you'd see every domestic oil project come to a halt. I hesitate to mention the ebola hysteria, but I will say that the most disconcerting fact to me is that of the 4,500 deaths 200 of those deaths (4.4%) have been health care workers. I know that protocols weren't always followed perfectly but the fact that 4% of the deaths in this outbreak have been health care workers is troubling. In my opinion, the greatest risk from ebola isn't catching the disease for the average American. Rather the risk is that fear grips the nation to a point where people stop traveling, avoid going to work or school, etc. This is a worst case scenario but today I read that 50% of Americans were re-evaluating plans to travel overseas (I'm not sure how they came up with that number b/c I'm pretty sure most Americans don't travel overseas to begin with but another story for another day). PS - as election day draws near remember that your vote is not for sale. I'm working on writing something on this subject but for now remember that if you don't fall for Party A or Party B's million $ ad campaigns, you can change course of history. After suffering the market's worst losses in 6 months on Tuesday, stocks shot back up on Wednesday and had their biggest intraday swing to the positive side in nearly 3 years. So obviously, today stocks would........ yep, you guessed it sell right back down to Tuesday's levels. 2) The Fed - and other central banks - are providing adequate liquidity to keep the markets moving. The problem is one major component of the Fed's strategy is coming to an end in October. At this point, it seems like a game of musical chairs and no one wants to be the last one standing when the only game in town takes their soccer ball and goes home for dinner. 3) The charts - stocks have been bought aggressively on every dip since 2010. Maybe this time is different, maybe not. I'd watch 4300 on the NASDAQ and 1900 on the S&P 500. Breaking through those levels opens us up to some real good old fashioned downside. I'm not calling for it yet, but the charts suggest that successive closes below 4300, 1900 brings long-term 200 day moving averages into play which are about 20-25% lower. From the "Please make it stop, my head hurts" file: City employee driving in city vehicle hits her own personal car. Now suing the city for damages. "By her own recollection, St. Paul Parks and Recreation employee Megan Campbell was driving a supply van back from a city storage building on the city's West Side when she turned a corner, causing serious front-bumper damage to a parked car. The damaged 2001 Nissan Pathfinder in question wasn't just anybody's vehicle. It was her own. Now, Campbell has filed a claim against the city seeking $1,600 to $1,900 from public coffers for damage caused to her personal vehicle by a city worker -- herself. "Because I was working for the city and driving the city vehicle, I feel they are responsible for paying for the damage done to my car," Campbell wrote in a "notice of claim" form received this week by the city clerk's office." There is no way Parks and Recreation on NBC doesn't steal this idea for an episode this year. Today, the markets started off like just about every other day during the last 2 weeks. Stocks were off 0.7% or so in the morning before the 11am "buy everything" programs kicked in. This brought stocks back to even or so, heading into the release of the FOMC minutes. Typically the release of Fed minutes is a relatively minor affair because the Fed does a good job telegraphing their game plan. And you couldn't be more wrong in the new normal. The added volatility lately has been caused by concerns that the Fed (and their counterparts around the world) have no bullets left to fight weakness in the economies of the world. Five plus years into the great recovery and here we sit with a fragile stock market bouncing around all-time highs but also needing reassurances that the Fed will come up with some way to support these record prices. Stocks made up for all of yesterday's big sell-off in one massive run of panic buying. I'm sticking with the thesis that a number of hedge funds struggled in the first 9 months of the year and they are attempting to make their bonus numbers in a short trading window. This is now the second time in a week that stocks fell 2% and raced back up 2% the next day. This kind of volatility is generally a signal of something important coming around the corner. @DougKass seems to have the best philosophy right now - "buy the dips, and sell the rips". I loved this tongue in cheek observation from Marketwatch re: traders. I've been saying for a couple of years that Wall Street moved to New Jersyey many years ago, but no one really noticed because all of the nightly images of guys in funny coats running around with ipads on the floor of the NYSE. However, as the article points out, this is really just for show. The bulk of the trading is now occurring in a climate controlled room in North Jersey. This story is exactly the kind of clickbait that makes Business Insider/Buzzfeed, etc, just insufferable at times. China Overtakes US as World's Largest Economy!!! However, this is based on the concept of purchasing power parity which is one of those wonky ideas that seems good in a classroom but is silly in practice. Yes, a Big Mac may cost less in China and thus a dollar (or yuan) earned in China is worth more than a dollar in the US but there are so many more intangibles that need to be input into the equation. In raw dollars, it appears as though the US economy is still $6 to $7 TRILLION larger than the Chinese economy, so no, China's economy (while growing impressively) has not overtaken the US. Score one for the clickbait truth squad. PS - leave me a comment or twoople me if you have a specific topic you'd like to see covered. This video will probably be everywhere in about 24 hours, but I thought I'd share it with those that have been kind enough to come back to the blog. I'll offer up a fair warning this is tough to watch because Brittany is a brave young woman making a fairly radical choice about her future and it will be unsettling to some. However, I think this is the next great debate in our society. Will we give people a choice or will we continue to fight diseases for which there is no cure? I don't have any answers but I'm glad Brittany was able to share her story. Since I'm on a bit of a posting binge, thought I'd share the following. 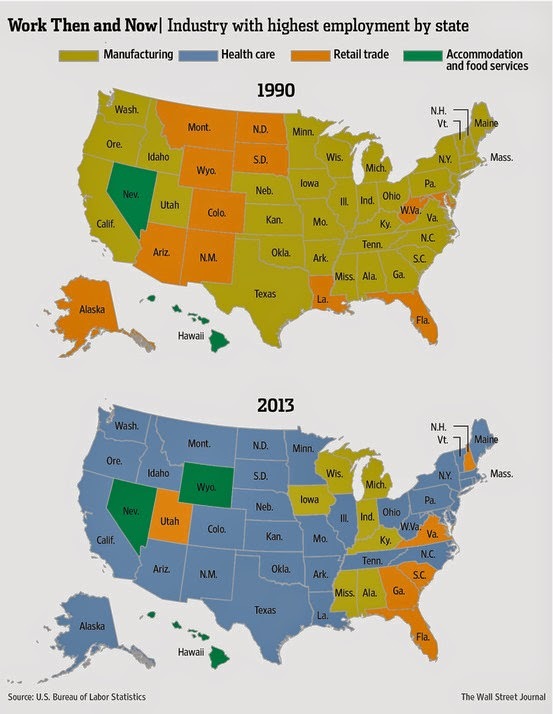 This is a pretty compelling infographic from WSJ which demonstrates the incredible shifts that have occurred in the US. As a friend commented recently "the only real expansion seems to be college campuses (funded by expanding student debt) or hospitals (funded by the explosion of healthcare spending)". Do you remember that game from The Price is Right called Cliffhanger? 2014 - Central Banking Bubble? but if you are, thanks for stopping by. The past four months have been very reminiscent of 2000 or 2007 and I've been trying to figure out how to summarize my opinions. For the time being, the markets continue to ignore warning signals regarding the global recovery. Increasingly banks and consumers are taking on increasing risks in an effort to maintain the status quo. * Subprime lending to autos has hit 31% in the US. * European economies are faltering in the wake of the EU/US sanctions on Russia. * Global unrest from Hong Kong to Ukraine (btw - this story will have legs. The "cease fire" is nearly a month old, yet battles are raging every day). * Yet, stocks are within about 2% of their all-time highs. Something is bound to give. I'm going to try to post more frequently and will include some non-partisan political commentary if that's okay with everyone. Congressional races across the US are become less about local politics and more about who can buy your vote. More on that soon.